The CoffeeShop Blog: CoffeeShop "Valentine Scribbles" Digital Paper Pack! 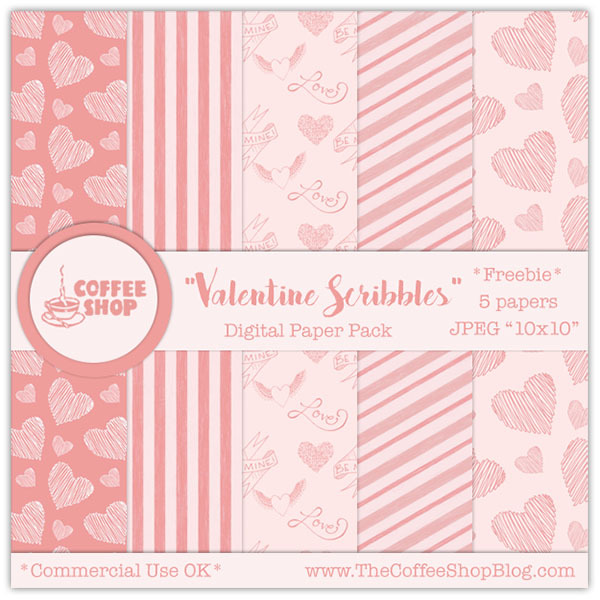 CoffeeShop "Valentine Scribbles" Digital Paper Pack! I wanted to start off this post by letting you know about an exciting new addition to my CoffeeShop Action/Preset Download Pack. I have well over 200 actions included in the pack so it can be difficult to choose which action you wish to run on each image. Now the download includes a pdf with before/after examples of the actions in alphabetical order. In addition, each action example is a clickable link that goes directly to step-by-step action instructions. Keep the pdf open while using the CoffeeShop actions so you can see what each action does and also instantly get step-by-step instructions on running it on your own image. If you already ordered the action pack, just email me and I will send you a link to the pdf instructions. And don't forget to check out my Digital Design pack, it is HUGE! A perk of your purchase (besides the convenience and helping support this site) is that you can download the newest packs for free if your initial purchase was within two years. Simply email me and let me know you want it. I update these packs weekly with new goodies! This week is really flying by. The weather has been gorgeous here, sunny and not too cold. Last week it was in the 70's during the day, this week it is in the 50's-60's. We haven't even had a hard freeze yet and it is February. Weather is always crazy and unpredictable, but I am not going to complain about being able to wear shorts during February. Our summers are so hot and humid we actually spend more time outdoors during the winter. I have a new Valentine-inspired digital paper pack to share with you today. I used some graphics from The Graphics Fairy to add the "hand-drawn" designs on these papers. Use these any way you like! Download the CoffeeShop "Valentine Scribbles" Digital Paper Pack. You can also grab it here. Pretty papers Rita. Thank you. I wish our dollar was doing better but it is in the toilet right now. I'd love to be able to support your blog but with the conversion rate, it is just way outside my budget. Maybe in the future. Your pdf guide sounds like an awesome addition! Good luck!